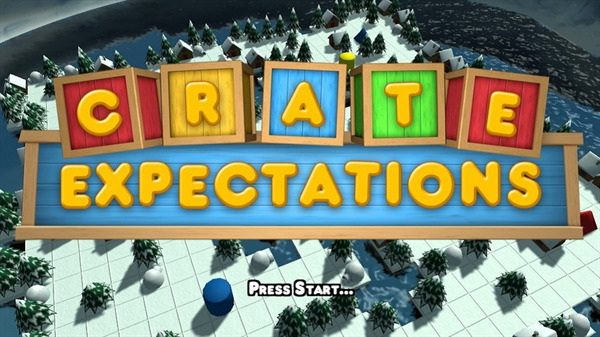 The objective of Crate Expectations is to slide your coloured crates from one end of the playing field to the coloured goal at the other end before your opponent. The amount of crates that must reach this goal is determined at the beginning of each game. You are allowed 5 actions per timed turn. Again, the amount of time per turn can be changed beforehand. On top of that, there are 4 ice blocks that are shared between you and your opponent. These can be used to either help you reach your goal faster, or block your opponent from reaching their goal. Some levels can be frustrating with a human opponent because they will block your path as much as possible. Although you can do it back to them, it becomes a really long game of back and forth blocking. After I think 2 turns, they melt and can be used again. Something that could have fixed this is to have had some sort of weapon power ups in the game – things such as a flamethrower to melt the ice blocks around you, or sledge hammer to break a crate blocking you. These power ups would be randomly placed on the level and earned by sliding over them. However, they are not included and I understand why. This game isn’t so much a race to the goal, it’s about getting to the goal while outsmarting the opponent, tactically planning your route, and blocking the opponents route. 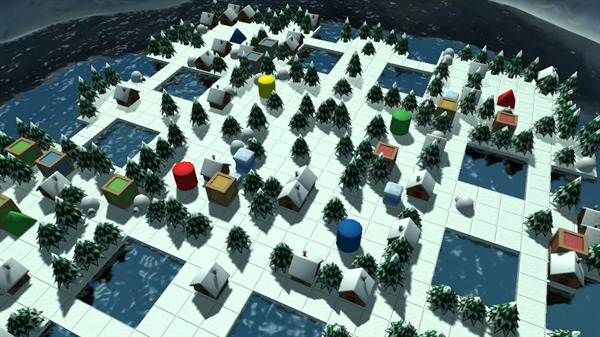 The game includes 4 player local, system link and online multiplayer in 22 different, unique, and challenging levels. You have many options in terms of who versus who. You can have computer vs computer, player vs players, player vs players vs computer, etc. It’s interesting to watch the computer’s AI play and see what they’d do differently in terms of moving around the level. Speaking of levels, they range from very small and compact, to large and open. There is a very nice variety of them too for plenty of different matches. If you need a better view of the map or just want to get a closer look at the detail, you can zoom in with the left and right triggers. Zooming out is extremely useful on the bigger maps. The graphics are polished, and the lighting is very well done. This game proves that even on the XBLIG section, games can have the same quality as an XBLA game. So, in the end, if you are looking for a challenging multiplayer puzzle game with many unique levels, this game is for you. Even if you don’t like these games, it’s still pretty fun to play. 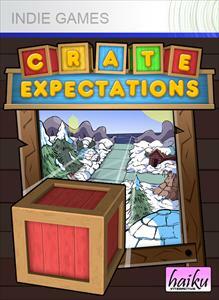 Crate Expectations is easily Worth the 240 points and I highly recommend trying it out. Game Score 8/10 for a polished and challenging 4 player puzzle game. Download a free trial of the game here. Thanks for this review! 8/10 is an awesome score and we’re really, really grateful. I’ve actually just submitted a new version for review that adds some new, simpler functionality – a better lobby system for local and single player games, more how to play screens and, most importantly, more levels! Hopefully it’ll be through review soon and everyone can enjoy this new, sparkly version.